Welcome to the world of informercial diet plans, terrifying wedding dance lessons, endless run-ins with the cutest guy Ann’s ever seen—and some surprises about her NOT-so-perfect mother. And there’s one more thing. It’s all about feeling comfortable in your own skin -- no matter how you add it up! This book is a must read. Period. I loved everything about it! Everything. Ann is hilarious. She is so real, it will be hard not to relate to her. The opening scene begins with her bathing suit shopping while her mom picks up a "motivational" teeny tiny bikini for Ann. This is not Ann's idea of motivation to lose weight. It's a nagging reminder of how far she is from being able to wear anything in that department store. Who hasn't felt like that at some point, right? 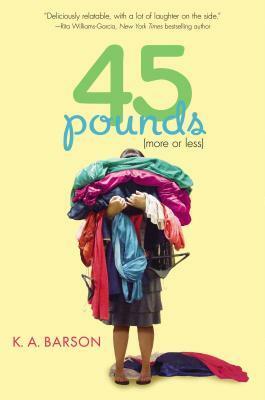 45 Pounds starts off being about Ann deciding to lose weight, but it quickly becomes so much more. There are so many subtle subplots that add a rich depth to the characters and the story. It's really hard to say what was my favorite part overall. Ann starts out on a journey to meet a goal, but in the process she learns some tough lessons about true friendship, her mother, family, and what it means to be 'healthy'. I just want to gush about how amazing this book is! I can't stop myself. I had no idea what it would be like when I started reading. I figured there would be a snarky narrator, but I got more than that. I found real emotion and a positive message. Everyone should read this book. We can all relate. As women, we are so hard on ourselves about our weight. Often, we don't realize what our subtle messages and attitudes toward food do to those around us. Parts of this book were a total eye opener for me, because I realized I was guilty of some of these things. Who would have thought that an adult could have learned a lesson about life from a YA novel?